Graton producer of Cabernet Sauvignon, Merlot, Chardonnay and Pinot Noir. Contains product descriptions, online ordering, a vineyard tour, recipes, and a company overview. Gravity flow winery built in 1897 in Pope Valley, producing small lots of reds and whites. Includes product descriptions, history, and news. Also has a tasting room in Calistoga. Small producer of small lots of estate-grown reds and whites. Includes product descriptions, history, and news. Main winery is in Pope Valley, with a tasting room in Calistoga. Award Winning wines from the Ohio River Valley. Located just north of Madison, Indiana our winery is dedicated to the revitalization of wine~growing in the Ohio River Valley. The smallest home-based winery open to the public in the Sonoma Valley. New Livermore Valley winery debuts its 1996 estate Merlot. A Hunter valley winery which has been producing award winning wines for over 30 years. Contact information and some pictures of a Moab-area estate winery. Established in 1828 in the Hunter Valley, this is Australias oldest operating winery. Visitors are welcome. A small winery located in the heart of Dry Creek Valley, specializing in premium quality Zinfandel. Winery news as well as detailed product and order information. Located near Oliver in the southern Okanagan Valley. A boutique winery in the Hunter Valley that makes premium wines including Chardonnay, Semillon and Shiraz. A small winery located near Ashland in the Rogue Valley of Southern Oregon. Specializing in well crafted wines. Boutique winery specializing in Pinot Noir and Chardonnay from the Russian River Valley. Brief description and contact information. A boutique winery offering hand-crafted wines from the Yakima Valley, including chardonnay, merlot, and cabernet sauvignon. Hudson Valley winery owned by the artist, Mark Miller. Site includes galleries, winery information, and online sales. Family-owned boutique winery in Edna Valley, specializing in Pinot Noir, Chardonnay, Sauvignon Blanc, Syrah, and Zinfandel. Temecula Valley producer of red, white, and sparkling wines. Includes product descriptions, a winery history, and an order form. Three generations of the Lanza family have operated this winery in Suisun City. Includes wine descriptions, club information, and online ordering. Family winegrowers and producers in the Cucamonga Valley. Features product descriptions, online purchasing, an award list, and a winery history. Family-operated producer of Pinot Noir, Chardonnay, and Syrah in Scotts Valley. Includes a winery overview and online ordering. Susquehanna Valley winery producing red, white, blush, and fruit wines. Includes product descriptions, online ordering, and a winery profile. Winery operating out of a residential garage, producing small lots of red wines. Contains a company overview, newsletters, pictures, ordering information, and recipes. Castro Valley producer of red, white, and sparkling wines. Contains product descriptions, ordering information, a winery history, a winemakers notebook, and event listings. Features Cabernet, Zinfandel, Chardonnay, and Merlot. Located in the Coloma Valley in El Dorado County. Contains descriptions of wines, a winery history, and an event calendar. Makes white, red, and pear wines in the Hood River Valley. Includes a product list and picture gallery, along with information on their bed and breakfast inn. Yarra Valley winery owned by wine writer James Haliday. Produces cool climate wines such as Chardonnay, Pinot Noir, and Cabernet Sauvignon. If the business hours of Martin Ray Winery in may vary on holidays like Valentine’s Day, Washington’s Birthday, St. Patrick’s Day, Easter, Easter eve and Mother’s day. We display standard opening hours and price ranges in our profile site. We recommend to check out martinray-winery.com/ for further information. 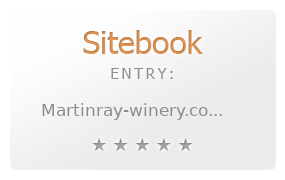 You can also search for Alternatives for martinray-winery.com/ on our Review Site Sitebook.org All trademarks are the property of their respective owners. If we should delete this entry, please send us a short E-Mail.